Private Academies of Chinese Learning in Meiji Japan: The Decline and Transformation of the Kangaku Juku. Copenhagen: NIAS Press, 2003. Paperback edition 2005. The establishment of a national education system soon after the Meiji Restoration of 1868 is recognized as a significant factor in Japan’s modernization, hence research on education is concentrated on the state system. However, this development did not mean the disappearance of the juku, the private academies which were so much a feature of the Tokugawa period. Indeed, these played a far greater role than has been appreciated so far and this book aims to rectify the omission. 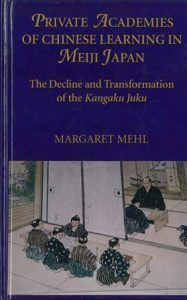 This comprehensive study of a little-known but significant area not only contributes to a better understanding of education in the Meiji period but is also relevant to the reform of Japan’s public education system today. Education was once viewed and organized very differently from today and the modern state-controlled system we take for granted is just as much a product of historical circumstances as the juku was; it, too, must therefore be open to challenge. The only study available in English of Japan’s traditional Confucian schools. Contributes to a better understanding of education in the Meiji period. Relevant to the reform of Japan’s public education system today. See book video here (this is a new version of a previous one).